Routers, like many other power tools, are dangerous if mishandled. Please read all of the safety instructions that came with your router. Think of the care you take when handling a sharp knife, then multiply that many times - a router is a very sharp knife, with the blade spinning very fast! Wear ear protection, even if routing for a short time - the high-pitched resonance of a router will leave a ringing in your ears for hours afterwards if you don't. If you're not sure if you should be trying a particular operation - DON'T. Routing takes confidence, which comes from practice and working up your skills gradually. Try again when you're more experienced. Routers are very versatile tools, but they have a serious bite if you get it wrong! Always take extreme caution when removing the protective wax from a new cutter. Do not pull it off, as the sharp cutting edges could cause injury. Carefully slit the wax with a sharp knife along the internal angle of the flute and prise the coating away. Before using a new cutter, wipe off any protective oil to prevent it transferring and marking the surface of the work. Never pull the cutter from the router by the cutting edges without protecting your hands. If your fingers slide along the cutting edges, you will find out just how sharp they are, then you'll delay progress whilst you receive first aid - and you could also bloodstain your wood! Older-style collets had a separate steel ring inserted in the collet nut. 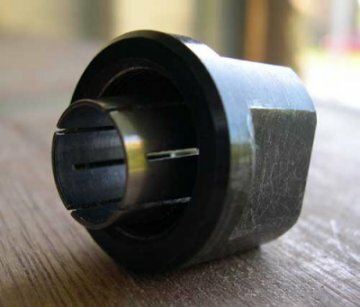 More advanced collet assemblies have a ring machined within the nut that engages the collet, automatically releasing it from the end of the spindle as the nut is undone. These are typically made of high quality, polished tempered steel and have multiple slits, ensuring both security and concentricity for the cutter. They also feature slits starting from alternate edges of the collet to provide even pressure over the full surface area of the cutter shank. A double-lock system is incorporated by some manufacturers. When the nut is undone, it will first loosen and then appear to re-tighten, requiring loosening a second time. This design prevents the cutter shank being released if the collet nut accidentally loosens while the router is running. The latest design collet systems have their collet and collet nut factory assembled and should not be separated. Always insert as much of the shank as possible into the collet and at least three quarters of the shank length as a minimum, to decrease the chances of deflection of cutter when under load. This in turn will prevent damage to the collet, reduce wear and stress on the router bearings and avoid the possibility of shank damage. However, don't allow the end of the cutter to be in contact with the internal end of the armature recess. Always maintain a gap (see diagram) of 1/16" (1.5mm). This will prevent the possibility of any "hammer action" being induced which could cause the cutter to creep out of the collet (the collet nut is represented by a rectangle, for clarity). Never clamp a short portion of the shank in the collet to gain extra length! Never use collet reducers (shown in blue here) as a means of extending the length of the shank! Always ensure that you have a minimum gap of 5/32" (4mm) between the collet and the cutter (shown here in red). Make sure that the collet is kept perfectly clean and corrosion-free. Resin can work its way up the slits of the collet and build up around the cutter shank and the inside collet faces. Resin build-up may cause uneven contact between the internal collet face and cutter shank. This could create a resonance, causing the shank to slip and leading to collet burn, deposits being evident on the shank as brown marks. Resin build-up can be removed by using an appropriate solvent and a fine wire brush. Surface corrosion can also occur on the inside face of the collet, which will restrict insertion and removal of the cutter. It can also cause scoring of the mating faces and could significantly damage the collet - sometimes beyond repair. Dust, corrosion or dirt will decrease the ability of the collet to grip or release the cutter shank. Other problems include the shank slipping, bit or collet seizing, or excess vibration leading to shank bending or breakage. A fine wire brush will remove such deposits, but don't use glass-paper as this will leave scratches, which could cause further problems. If either the collet or its nut are faulty, it is best to change both as soon as possible. Don't use cutters with damaged shanks, as this will lead to trouble. To prevent cross-threading and damage to the threads of the collet nut, the inside of the nut should be kept clean and free of burrs. If in doubt, replace the nut at the same time as the collet. Keep both the inside and outside tapered surfaces of the collet clean and free from dust, resin and dirt. This also applies to the inside taper of the arbor and the threads of the nut and arbor. Remove any deposits with a wire brush and regularly protect the surfaces with light oil or anti-corrosion spray. A problem can arise from metal fatigue in the collet, due to heat being transferred from the cutter, as repeated heating and cooling cycles may alter the original steel tempering. Sprung steel requires a degree of inherent elasticity in order to properly grip the cutter shank. This is reduced over time and increased tightening of the collet is then needed. This will eventually distort the collet, preventing it from exerting an even grip. Therefore, collets that need excessive tightening should be swiftly replaced. 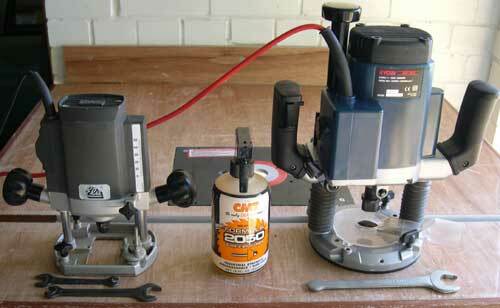 If vibration is noticeable when you are routing, switch off at once and investigate. First, check that the cutter shank is not bent, that the cutter is not damaged or blunt and that the cutting edges are not chipped. 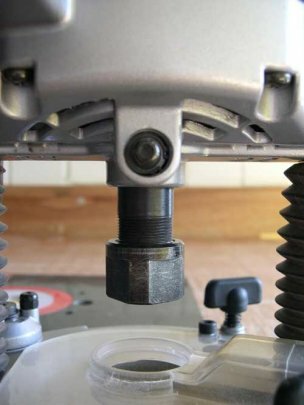 Vibration can result from a worn collet, which is holding the cutter out of line to the arbor axis. This may be due to a condition called "bell-mouthing" within the collet. Collet marks on the shank will show that the collet is worn and this can be checked by inserting a long cutter and tightening the nut. Apply sideways pressure on the end of the cutter and if there is any sign of movement, the collet must be replaced. 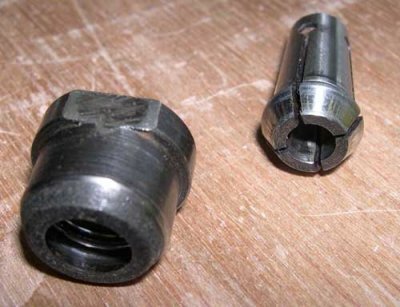 Replace the collet and the nut at the same time. 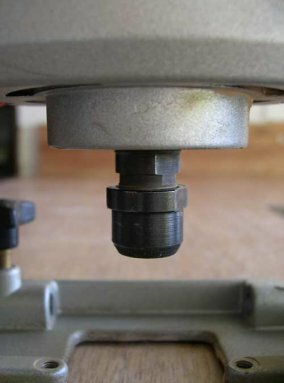 If there is no apparent wear in the collet or nut, the problem may be wear on the arbor, or within the router's main bearings, both major service tasks. Always remove the cutter from the router after use. This will avoid continual pressure being applied to the collet and the cutter shank, which could, in time, cause a permanent distortion. After cleaning, lightly oil the collet before storing, particularly in humid conditions, to avoid corrosion or surface pitting. The feed direction is the direction in which the cutter is fed into the material or, in the case of table mounted or fixed routers, the material into the cutter. Following the correct feed direction will ensure safer and easier working, and allow the cutter to cut efficiently. The correct feed direction is always against the rotation of the cutter. This can be ascertained by looking at the cutter itself. Routers rotate in a clockwise direction (when looking down from above the machine) and this determines the direction in which the cutter rotates and - subsequently - the feed direction. If the feed direction is incorrect, the forces involved in cutting will cause the cutter to try to drag the router along the workpiece. This situation can swiftly become unstable and dangerous, particularly if it takes the operator by surprise. When routing inverted in a table, the feed direction is right to left. If the material is inadvertently fed in the wrong direction, it could be ripped away from the operator and - in the worst case - drag the operator's hand into the cutter. Whilst it is possible to take a very light "cleaning" pass in the "wrong" direction (known as "climb cutting"), this is an operation that should only be attempted when the operator is fully conversant and totally confident in handling and controlling their machine. It is a good practice to mark the direction of feed (right to left) on the worktable fence when using your router inverted in a table. With portable routers, the rotational direction of the cutter is often marked on the machine, although with experience this will become second nature. Many modern routers have variable speed, set with a thumb-wheel or slider. 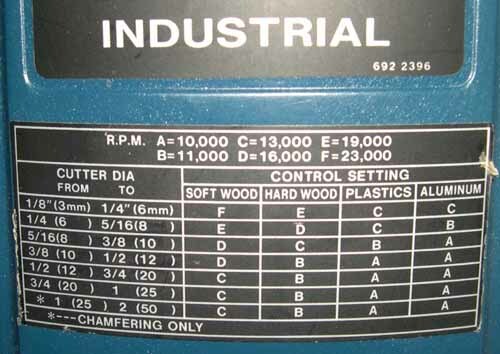 Some have a recommended speed chart attached to the router body, like this one which relates to the markings "A" to "F" on the speed thumb-wheel and speeds of between 10,000 and 23,000 rpm. Routers with a single speed will rarely be able to use large cutters, as they will exceed the RPM recommended by the cutter manufacturer. Separate variable speed controllers are available for connecting between the router and the power source. However, these are unlikely to offer full wave rectification or speed compensation and do not maintain the available power evenly throughout the speed range. Inferior types of speed controller can also affect the smooth running of a router, particularly at lower speeds. To minimise wear on the router motor bearings, to prevent cutter damage and to improve the finish of the cut face, it is important to maintain a constant feed speed. Variations in the type of material, type and condition of the cutter and the available router power will all have an effect on feed speed. It is for the woodworker to judge, by the sound of the router motor, whether the motor is labouring. In time, you will acquire a feel for the router and a feed speed relative to the work in hand will come naturally. You will find that a narrow cutter can be used at a higher speed than a wider one, although very narrow cutters will need a slower feed speed and smaller depth of cut to prevent breakage. Feed speed will also be affected by the type and density of the wood, the grain direction and any variation in the texture of the material along the cutting line. Beware of hard knots as these can damage the cutting edges or even chip or fracture the TCT tips. Also avoid 'dead' or loose knots, as they can be ejected and cause injury, as well as causing tip fracture. If the cutter is inclined to burn the material, it is a sign that the cutter is blunt, or that it is being fed along the cut too slowly. Templates are very useful for the production of identical parts all at one time, or the exact replication of a part at any later date. They can be used in a couple of different ways, either with a bit that is equipped with a guide bearing, or by using a guide bush in the router base. If the bearing-guided cutter is to be used, the template must be made to the exact size of the finished article. Whether the bit has the follow bearing at the bottom (as in "A") or the top of the cutter (as in "B") - some specialist cutters have both - dictates how the template is used with the stock material. When using a bit with a bottom-mounted guide bearing, the template must be BELOW the stock to be routed. The bit depth is adjusted to ensure that the bearing will contact the template, then engaged with a sideways motion. Once the bearing is in contact with the template, it will follow the template shape, removing excess stock until the shape matches that of the template. To save stress on the cutter, first remove as much excess material as possible from the stock (jigsaw, bandsaw, etc. ), then there will be less material for the router bit to deal with. When using a bit with a top-mounted guide bearing, the template must be ABOVE the stock to be routed. 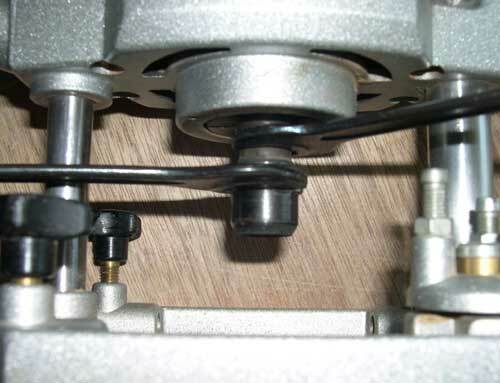 The bit is adjusted to again ensure that the bearing will contact the template, then engaged with a sideways motion. Once the bearing is in contact with the template, it will also follow the template shape and remove excess stock until it matches the shape of the template. As before, first remove as much excess material as possible from the stock. Using a guide bush in the router base is another common way of following a template, with two major differences. The first is that there is no need to use a bearing-guided cutter - a straight cutter is suitable for the task. Secondly, the size of the template will differ from the intended finished article. With internal templates, such as a circle-cutting design where the guide bush follows an internal edge, the actual template will need a hole larger than the finished dimensions by the distance between the outer surface of the guide bush collar and the cutting edge of the bit (the collar-to-bit offset), as shown here. Therefore, when cutting a template for hinge fitting, because you are cutting the mortice using internal edges, the template has to be larger than the hinge by the collar-to-bit offset. For external templates, where the guide bush collar follows an external edge, for example, when making a curved shape, the template will need to be smaller than the finished dimension by the collar-to-bit offset. When a router follows a template, it will reproduce everything it follows, including lumps, dips and roughness. So one thing is clear - the more time you spend in getting the template edge absolutely smooth and free of imperfections, the better the finished result will be. My preference for templates is MDF, because I find it easier to get a smoothly-sanded finish on the edges than I do with plywood. The router is a very versatile tool and one that is very satisfying to handle skillfully. As with any other skill or technique, practice is the main ingredient to success. Above all, please BE SAFE! A ALWAYS use the router and other power tools in a safe manner and away from children. N NEVER leave the router running unattended. Wait until the router comes to a complete stop and switch off at the wall outlet before making adjustments, changing the cutter or operating the spindle lock. B BEWARE of unsafe working practices and potential hazards when using a router. O OBSTRUCTIONS should be kept clear of the path of the router and the routing area. Do not clear swarf or other debris away from the cutting area with the machine still running. C CLOTHING, such as ties or loose or baggy garments, which may be accidentally caught and pulled into the cutter should not be worn, or should be tied back when using a router. P POWER to the router must always be switched off and the machine isolated from the supply before changing cutters or making adjustments. Make sure the power switch is 'Off' before plugging in, to avoid accidental starting. D DUST presents a severe health risk if inhaled. Always wear a dust protector and/or use a vacuum extractor connected directly to the router. Q QUESTIONS regarding the safe operation of your router should be directed to the manufacturer's technical department. E EYE protection must also be worn to protect the operator from ejected waste particles. EAR protection should also be worn, especially when routing for long periods of time. R ROUTERS must be allowed to reach their full running speed before commencing any routing operation. Do not switch the router on with the cutter touching the workpiece. F FEED direction of the cutter into the workpiece, or the workpiece into the cutter, should be against the rotation of the cutter. S SHORT-CUTS must not be taken to the detriment of safe working practices. G GUARDS should always be used when using a router mounted in a table. Always ensure that your fingers cannot make contact with the cutter. Always use a push stick together with hold down clamps or featherboards when machining small timber sections when the router is mounted in a table. T TIDY work areas and benches help to prevent accidents. Always keep the floor around the work area clear of all obstacles. Store router on a shelf, in a cupboard or in a storage box, so debris cannot fall into the air intake. H HURRIED setting up can lead to accidents. Take your time to prepare yourself and the machine. Carry out safety checks before switching on. U UNDERSTANDING the current statutory woodworking regulations is essential for all professional users. 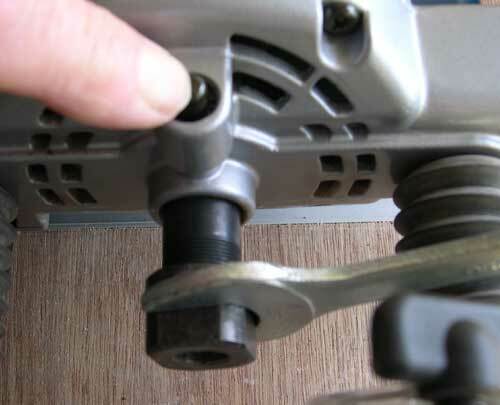 I INSPECT the condition of the router cutter before use. Ensure that the cutter is held firmly in the collet, rotates freely and is well away from the work before the power is switched on. V NO-VOLT release switches should be fitted to all table-mounted routers, both to isolate the router in an emergency and to prevent it switching back on when power is restored after a power failure or supply disconnection. J JUDGE the correct feed speed by listening carefully to the tone of the router. W WORKPIECES must always be securely and safely clamped to the work bench, in a vice or by some other means prior to commencing the routing operation. Make sure that clamps are not within the path of the router. K KEEP router cutters sharp. Take care when handling them, especially when removing them from the collet or from a storage block. X EXAMINE the cutters and router collet before use. Equally check that any knobs or screws on the router are tight and have not vibrated loose. L LISTENING to the sound of the router will often indicate that the cut is being made too deep or that the cutter is blunt. Y YOUR safety when routing is more important than the router or its cutters. M MANUALS and other information supplied with the router or cutters should be read thoroughly to ensure you are familiar with the controls, functions and operating procedures. Z ZERO accidents should be the first consideration when using routers and other power tools.